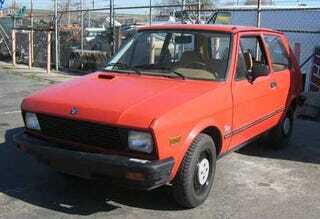 How About A Yugo For The 24 Hours Of LeMons? When we were at Evil Genius Racing to get the cage put in the Black Metal V8olvo, we couldn't help but notice the bright red Yugo GV parked by the shop. Turns out the little Balkan pseudo-Fiat belongs to laboratory assistant and expert welder Evil Clint, who picked it up for next to nothing and is contemplating turning it into a 24 Hours of LeMons car. If he does... well, a Yugo would be a likely shoo-in for the People's Choice award, but it's a good thing Evil Genius Racing builds such solid rollcages- just imagine being in a Yugo on the same track as, say, the Size Matters Fury! Make the jump for more photos. Move Aside, LeMons Teams: Evil Genius On Board! My favorite part? The "Use Only Geniune Yugo Service Parts" sticker on the air cleaner. You wouldn't want to put any low-quality parts on your Yugo, would you?